Ginger Zyskowski is an artist in every sense of the word, using fiber, poetry, musical compositions, and yes, drumsticks to create works of art at a high level of achievement. Not content to create in isolation, she shares all these talents with others in the Hutchinson, KS area and beyond. Ginger performs with Music Theatre of Wichita, the Wichita Symphony, and the Hutchinson Symphony as well as various gigs throughout the year. Beyond her percussion performances, she is a writer (with a new book recently published), a fiber artist, a composer, and an educator. In fact, Ginger has spent much of her career educating children, young people, and adults in the arts, nurturing their love and talents as a master teacher and using her special feminine touch to reach deeply into the souls of even the most macho of performers. She owned and operated the Professional Drum School in Hutchinson for many years, influencing countless lives from that venue. 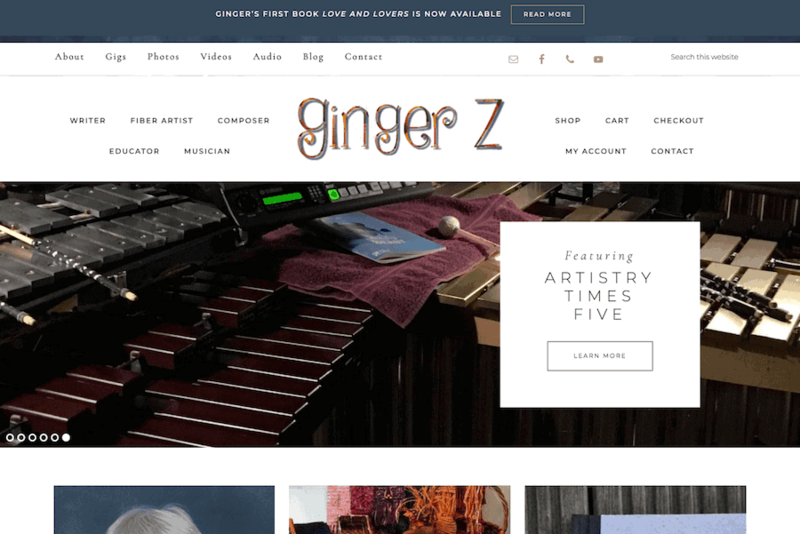 Ginger and I knew that her website needed to present these varied talents to her readers, and so we created the theme, “Artistry Times Five.” You can click on one of her artistic endeavors in the left menu to learn about her many rich experiences and projects. Buy her book, read her fun “Just a Thought” blog, browse and purchase lovely handmade items, listen to her percussion compositions and performances, and read about her background with various recording artists. You’ll learn a lot and have fun along the way!